In Jewish, Christian, and Islamic tradition, Cain and Abel were sons of Adam and Eve, the ancestors of the human race. Cain killed his brother Abel, becoming the first murderer. The story of Cain and Abel is echoed in the mythologies of many cultures and suggests several symbolic interpretations. The First Murder. According to the book of Genesis in the Bible, Cain and Abel were the first two sons born to Adam and Eve after their banishment from the Garden of Eden. Cain, the elder, became a farmer, while Abel became a shepherd. They offered sacrifices to Yahweh, or God. Cain brought fruit and grain; Abel brought lambs. When Yahweh accepted Abel's offerings but rejected those of Cain, Cain was hurt and angry. In a jealous rage, he killed his brother. 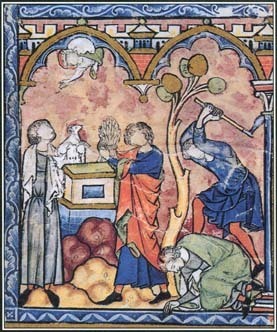 This illumination from a medieval French manuscript shows episodes from the story of Cain and Abel. The story may reflect the practice in the ancient Near East of sacrificing animals to obtain a good harvest. him from further punishment. Tradition holds that Cain's son Enoch founded the first city and that other descendents of Cain invented music and metalworking. Cain may be a mythological representation of a Near Eastern people called the Kenites, who practiced metalworking and musicianship and who may have worn tattoos. Medieval Christians believed that Cain had a yellowish beard, so artists and playwrights used yellow beards to identify murderers and traitors. Because Christians sometimes viewed Cain as a forerunner of the Jews who killed Jesus, yellow became associated with anti-Semitism. Abel, an innocent and godly victim, was often compared with Jesus. Symbolic Interpretations. Conflicts between brothers abound in world mythology, reflecting the widespread view that conflict between good and evil is an inescapable part of human life. In Persian mythology, the rival brothers are the gods Ahriman and Ahura Mazda. Islamic tradition calls them Kabil (Cain) and Habil (Abel). One interpretation of the Cain and Abel story is that it reflects the very ancient tension between the different values and ways of life of wandering herders, represented by Abel, and settled farmers, represented by Cain. Other views suggest that the story is about the death of innocence or that it illustrates the need for self-control and the high cost of giving in to competition and jealousy. See also Adam and Eve ; Ahriman ; Ahura Mazda ; Eden, Garden of .